Ocean House condos are located in the popular West Beach area of Gulf Shores. West Beach doesn’t have an entrance from the West which contributes to West Beach being much quieter and having a lot less traffic that other parts of the island. The end, or Laguna Key, features mostly beach houses in rows or tiers. The views from this area are great, especially at night – the natural gas platforms are lit up resembling fire flies buzzing over the gulf. The road in, Beach Blvd, is approximately six miles long – from Gulf Place to Laguna Key which is the upscale community on the Gulf of Mexico at the end of Beach Blvd. On the North side of the road, is Little Lagoon and on the South, the gulf. First, Little Lagoon is a fairly large lagoon with an opening at the West Beach Pass allowing smaller vessels access to the gulf from the pass. Ocean House is actually one of the last condos on the Gulf of Mexico in the West Beach area with an older, wooden-construction condo in Sunrise Village being the last gulf-front condominium. After Sunrise Village, the beach opens up to beach houses only, but many of the beach houses are large in the 5+ bedroom range. Ocean House is close to area attractions like the Gulf Shores Hangout, Waterville, the Track, and all of the other fun things to do in Gulf Shores, Alabama. Ocean House is a great rental property for investors and a great vacation destination for families looking to get away from work and obligations for a few days, a week, or even longer. Ocean House typically rents long-term in the winter and weekly in the Summer months – even for a weekend. Ocean House consists of two towers with larger wrap-around balconies on the corner units and all condos in Ocean House are directly on the Gulf of Mexico with private balconies overlooking the beach and the gulf. Security, pools, and a beach rental service offering chairs and umbrellas to beat the heat are available and Bahama Bob’s is one of the last remaining gulf-front restaurants in Alabama and a short walk from Ocean House. Also, visit our Gulf Shores condos for sale page for comprehensive info on every condo in Gulf Shores, along with helpful maps and aerial imagery. All of the condo pages on our website feature a similar setup. Starting at the top of the condo’s sales pages, the address is linked to Google maps making it easy to find directions and any kind of info featured on Google maps. Within the IDX info, find StreetView, Bird’s Eye View and, of course, detailed property info. 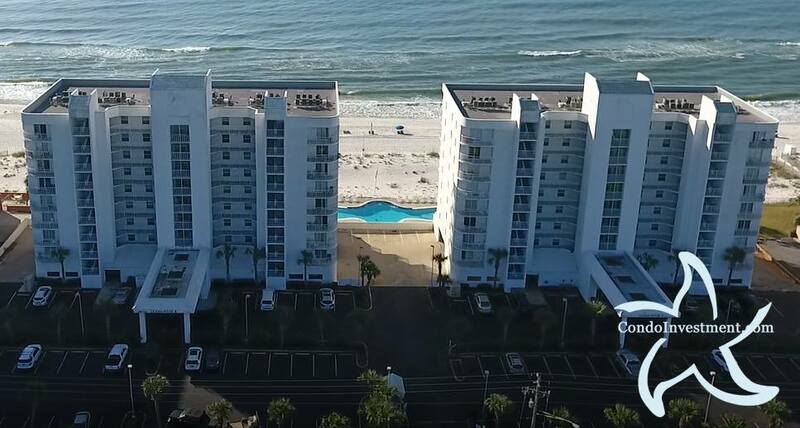 Next, we’ve provided aerial videos for many of the Gulf Shores condos, especially those on the Gulf of Mexico, Little Lagoon or Mobile Bay. In this same area, we’ve added links to quickly find recently SOLD condos with the past two years of SOLD data that include the actual SOLD price and closed date. Our Quick SOLD Search lists every condo in alphabetical order for quick and easy identification. We’ve linked to our Facebook condo pages and info on how we use our condo network to market condos. We use our network for both real estate sales / listings and also past clients that we help with rental marketing. This is a service we only offer our clients that piggybacks off of the number one ranked condo sales website on the Alabama Gulf Coast. We rank #1 for almost every condo sales search on the AL coast. This traffic comes from two groups: those looking for investment property to purchase and those looking to vacation at the beach and use our websites to research condos for their trip. Another very popular feature of our condo network is the investment information. We’ve published Alabama Gulf Coast condo revenues – every building in both Gulf Shores and Orange Beach. Each condo’s sales page offers the revenues, but we’ve also published a master page that offers revenue info for all of the other condos in alphabetical order to quickly find any condo and reference the investment numbers for that building. This info along with the recently SOLD numbers and examples of cash flow help for users to determine the cost of owning a condo at the beach. We’ve tried to make it as easy as possible to research Gulf Shores condos from the comfort of home. We’re always around to help with questions, but don’t like to hold information hostage and try and force customers to contact us. Everything on our network is free. We provide this wealth of information knowing that when someone needs a great real estate professional, we’re around and wrote and published everything on this website ourselves – we’ve been here doing the same thing since 2001 and we know the market and help our clients well after closing.